Trace energy flow from the sun through living things. Diagram an energy/food pyramid that illustrates the �Rule of 10�. Endangered Ecosystems - Investigate some of the animals in a Mexican ecosystem. Figure out who are the predators and who are the prey and build your own food web. Create a food web characteristic of a Tennessee ecoregion composed of at least four trophic levels. Extract two different, four trophic level food chains. Describe how species biodiversity relates to ecosystem stability. 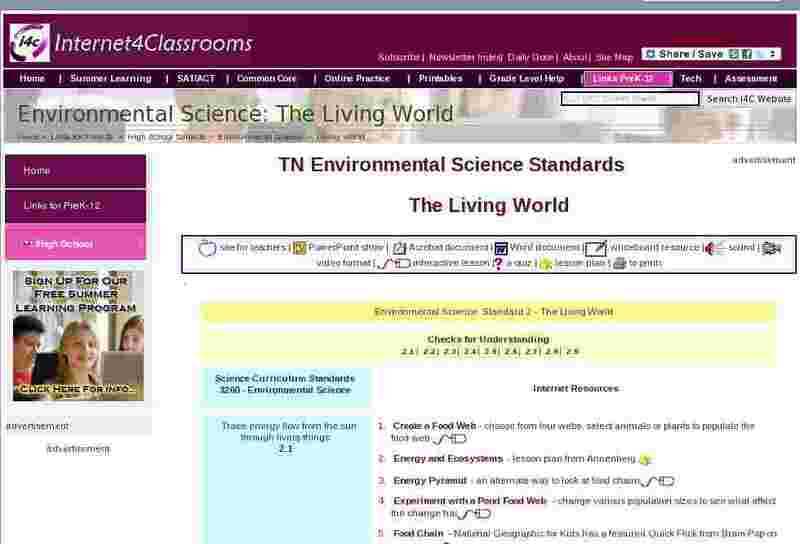 Describe plant and animal adaptations found in each of earth�s major biomes. Identify the locations of earth�s major biomes using a globe or map. Develop a visual display to compare and contrast primary and secondary biological succession in one of earth�s major biomes or aquatic habitats. Explain how human activities such as lawn mowing, gardening, farming, logging, planting trees, mining, and urban development advance, halt, or slow succession. Draw and explain diagrams illustrating each of the following biogeochemical cycles: water, carbon, nitrogen and phosphorus.